112 p. : illus. : 23 cm. The religion that today has more members than any other in the world- Christianity- began as one of dozens of religious faiths practiced in the Roman Empire during its early centuries. Church history--Primitive and early church, ca. 30-600--Juvenile literature. 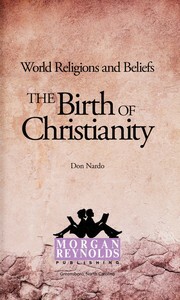 245 Title 14 $a Title The birth of Christianity. 300 Physical Desc __ $a Extent 112 p. : illus. : 23 cm. 520 Summary __ $a Summary, etc. note The religion that today has more members than any other in the world- Christianity- began as one of dozens of religious faiths practiced in the Roman Empire during its early centuries. 650 Subj:Topic __ $a Topical term Church history--Primitive and early church, ca. 30-600--Juvenile literature.